Treat your pet like Royalty with thie Regal Raised Elevated Dog Bowl featuring a sturdy metal frame that firmly holds the stainless steel bowl in place and effectively prevents messes and spills. It will change both of your attitudes toward meal time when your pet no longer needs to struggle and crouch down to eat. The Royalty Regal Elevated Dog Bowl comes with non-skid plastic tips on feet of the raised dog dish feeder stand. 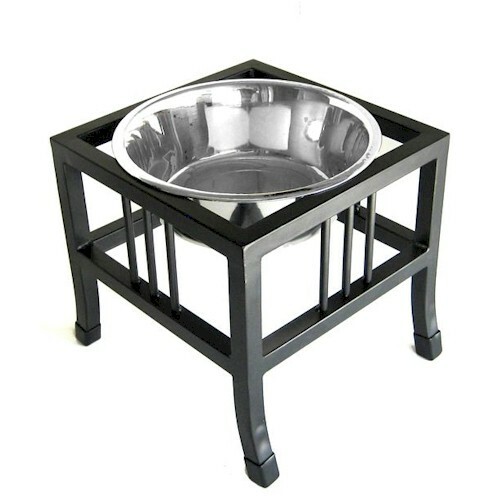 This elevated Royalty Regal Raised Elevated Dog Bowl feeder is perfect for all dogs of any size. The raised elevated dog bowl is available in 3 sizes. It allows your dog to eat in a natural position which improves overall health and posture. If your pet suffers from back pain this bowl is sure to help.